One of my favourite things about this blog is how it connects me to other like minded people in the business. Today I am chatting to Olga Rumble, founder and formulator at the gorgeous The Rose Tree, a brand I have mentioned several times over the years and also a long term advertiser on my site. Olga’s products do exactly what they say they will do, they provide effective and luxurious formulas made with gorgeous botanical ingredients. There is something I believe in the range for everyone, whether they have a preference for natural and organic beauty or not. Olga’s beautiful packaged skin treats will provide extra care for any skin type, but are perfect for dry and mature skins. AG – Hi Olga. Can you tell us a little bit about yourself and your business? For as long as I can remember I have had a fascination (or possibly obsession) with plants and herbs. One of my favourite Christmas gifts when I was younger was a copy of Culpeper’s Complete Herbal from my lovely Dad. The power and rich history of these plants fascinated me. I dreamt up all sorts of concoctions, to try on my sisters (victims) with varying degrees of success. 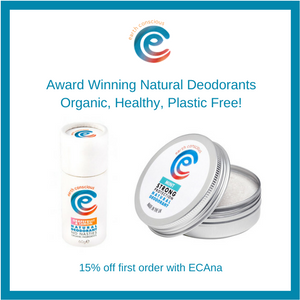 Today, I’m on a mission to produce EXTRAORDINARY organic products for body and soul. Most of us have so much stuff flying around in our heads that we don’t know if we are coming or going. We are balancing jobs, children, parents, and at the same time feeling guilty that we haven’t cleaned the bathroom. We put ourselves under so much pressure that we can’t function. AG – What is your favourite thing about formulating with natural ingredients? The choice! 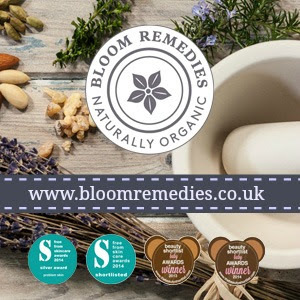 We have such a rich history of using herbs and botanicals in Britain, and these are ingredients that have been trusted and used for centuries. The increasing passion for natural beauty and move toward a more holistic view of beauty, and away from synthetic, mass produced products made with questionable ingredients is fantastic! AG – What is the best piece of beauty advice you have ever been given? Definitely to tread gently and take it back to basics. Caring for your skin and getting a radiant glow doesn’t have to be rocket science. In fact the more products you throw at your skin, often means the more sensitive and fractious it gets. Get the basics right, cleanse, moisturise and nourish your skin with gentle ingredients, nourish and nurture your body and you will be well on your way to that healthy glow! AG – Do you have a favourite skincare ingredient/s and if so why do you love them? I have several favourites – and these tend to change depending on my mood and the time of year. Right now I am loving frangipani, which is one of the hero ingredients in my Intensive Balm. I love the delicate, floral scent. I also love roses (no surprises there!) – the beautiful pure essential oil with its heavenly scent, the vitamin A packed rosehip oil; such a versatile ingredient! AG – Is there a beauty product you can’t live without in your routine? I am a huge fan of facial oils generally – I stress to my customers that they are a great addition to a skincare routine irrespective of your skin type, and especially as we get older. I use both my Deep Nourish Facial Essence with Rose & Blackcurrant and Rose & Marula Facial Essence interchangeably, depending on whether my skin needs moisture of is going through its irritated phase. I also change them up by combining with a tinted moisturiser if I need some extra coverage, or with a richer moisturiser like my Intensive Balm when my skin is feeling dehydrated. What is your favourite way to unwind at the end of a long day? Definitely an aromatherapy bath. In the summer, I like the water warm, and if it’s freezing, then I’m all about steaming water, (although I encourage all of my customers to try not to have the water too hot!) I love how essential oils find their way from flowers, seeds and leaves, and the aromatic molecules interact with sensors in our nose and pores in our skin. De-stressing, calming or a homely, comforting blend, an aromatic bath can do it all! AG – What does natural beauty mean to you? I believe that beauty is all about feeling good, and yet we are bombarded with images of unattainable perfection all day every day, that leaves most of us feeling inadequate or just ready to give up. The ultimate irony is that the models themselves don’t even look like their pictures – they have been stretched, primped and manipulated beyond recognition. Add to that the multiple-step skincare routine, with the ridiculous number of ‘must have’ latest products, the dodgy ingredients, cheap fillers and the fact that the packaging can cost as much as or even more than the contents and you realise it’s complete madness. I have a different view. I like organic; I like my skincare ingredients to not have been fiddled with too much. And I definitely prefer them without pesticides. AG – What does the future have instore for The Rose Tree? I’ve always got my eye on shiny, new products. We launched two new body oils this summer. That’s definitely the best part of the job! I’m also very proud to be taking my Rose Tree goodies further afield. We have launched in Malaysia with our partner, Metrojaya, in August. I’m also expanding to South Korea and increasing our reach in Europe. Thank you so much to Olga for sharing what natural beauty means to you and letting us a little bit more about your brand. You can see my review of the Intensive Balm with Marshmallow here, one of my favourites from the brand. 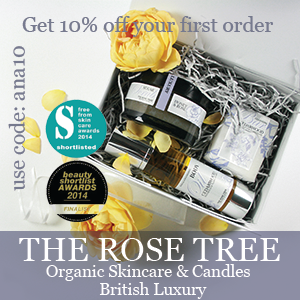 You can shop the Rose Tree at www.rosetree.co.uk (Get 10% off your first order with code ana10) and at beauty boutique Love Lula* who ship internationally. Some of the links in this post are affiliate links (these are marked with a *). Please see my full disclaimer for details.